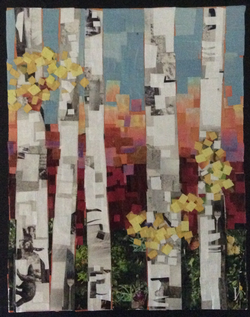 NEW for 2019, attendees will create a beautiful Birch Tree piece that is more in line with the style of collages Anje makes as a professional artist. The new class is for anyone who aspires to do hangable artwork in 2 hours while sipping wine and enjoying the company of old and new friends! Only 20 spots are available in each class so get your tickets early. Fee includes all materials, one glass of wine of your choice, and a heck of a good time!